← The Sports Archives – Bobby Abreu: Is He a Good Sleeper Pick? Formed initially in 1877, Wimbledon tennis has evolved from a garden party into what it is today: a world-class grand-slam competition. A few decades later and the traditions of this prestigious tournament continue, the only event of its kind to be played on grass. Known to attract the royal patronage to its famous box seats, the 2012 tennis championship proved no exception with both Prince William and Kate Middleton in attendance. Could it be the strawberries and cream? Other customs include a strict court-side dress code, which they relaxed this year for the first time in Wimbledon’s extensive history. With the 2012 Wimbledon Tennis Championship finally over, leaving Roger Federer with a new title to add to his repertoire, it’s time to recap on the top players to grace the tournament’s grass courts. Holding a league of trophies between them, these men are the trained muscle behind the rackets – the manliest of Wimbledon’s men. Roger Federer: Winning a record-tying seventh Wimbledon title, 30-year-old Federer proves that age is really nothing but a number. For many tennis players, the big 3.0 will mark a decline in their careers as pro sportsmen – apparently not for Federer. Winning a record 17 Major singles titles, Roger will surpass Pete Sampras as occupying ATP’s no. 1 position for more than 286 weeks come July 16th. A true champion, his latest win at Wimbledon will put him on the ‘Top 100 Greatest Tennis Players of all Time’ according to the Tennis Channel. Pete Sampras: With Federer only recently breaking his record as ATP’s longest-held no. 1 position, Pete Sampras is the legendary sportsman who was recently quoted as saying that he both hated and loved Wimbledon tennis. First discovering his passion for the sport at age seven, Sampras has held many prominent sports titles in his career, most impressively his “Sportsman of the Year” title awarded by the U.S. Olympic Committee – he was the first tennis player to ever receive this level of recognition. Roy Emerson: Known as the country boy from Queensland who changed the face of Australian tennis, Emerson holds 28 Major titles (an all-time record for a male player). Occupying the elite position of one of only seven men to win all four Major titles in his career, a small list that also includes Roger Federer, Emerson is definitely one of the greatest tennis players of all time. One thing is for certain, his double Grand Slams at previous Wimbledon tennis tournaments were the pinnacle of his time spent as a pro-athlete. 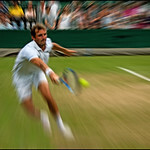 Roger Federer, Pete Sampras and Roy Emerson are the best of the best when it comes to Wimbledon tennis. Achieving some of the most well-known grand slams to occur on the famous courts’ grassy lawns, these three players are the epitome of the male sports persona – and will definitely stand as mentors to the next generation of professional athletes. Bella Gray is a sports blogger who has a fetish for Scruffs Boots. A maestro of tips and strategies for sustaining your wellbeing and keeping fit, Gray is the perfect go-to-gal for all your exercise queries and solutions. This entry was posted in Tennis and tagged grand slam, Pete Sampras, prince william and kate middleton, roger federer, Roy Emerson, sports, sports and leisure, Sports Archives, tennis, wimbledon championships, wimbledon tennis championship, wimbledon title. Bookmark the permalink.